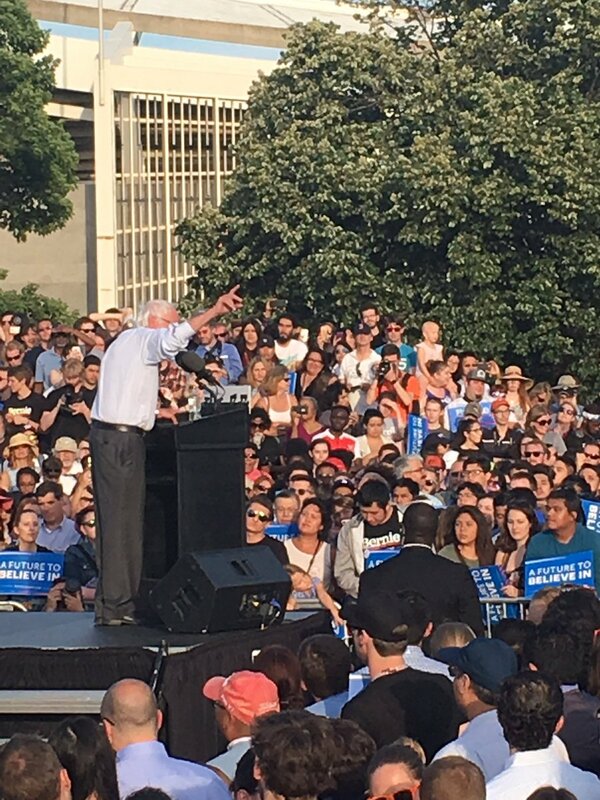 June 9, 2016, Washington, DC -- Bernie Sanders, Democratic Presidential candidate, arrived in Washington D.C. today speaking to supporters and the public at the Maloof Skate Park adjacent to the historic RFK Stadium in Ward 6. "It is too late for establishment politics and economics” said Sanders, inferring his concerns about DC's ridiculously high unemployment rates in East of the River neighborhoods, as well as critiquing DC's overall poor municipal planning. "Having our infrastructure collapse in front of us while so many workers are sitting out there idle, waiting to ready to rebuild that infrastructure, unacceptable." It would seem Bernie has entered the DC Twilight Zoning episode. But it was after Bernie's usual public material (standing up for working families; healthcare for all; inclusive planning and politics) he reminded the crowd of DC's "colonial" status as being "reprehensible." Sanders said, "DC has about the same number of residents except we have two senators and one congressperson with full rights, while DC does not. That does not make any sense." Of course, the contextual paradox surrounding Bernie's comments about democracy and DC was, and is, the mass-media's pronouncement that Hillary Clinton has already won the "Democratic" primary. The "historic" headline germinated by the Associated Press and subsequently spread to nearly all media-conglomerates and corporate networks, including NPR, cynically mocks the Democratic party's own democratically-chosen rules -- you know, the concept of a Democratic Convention where delegate votes are tallied and a winner is announced. Maybe the media's behavior can be rationalized by the Democrats more recently-outed strange voting system consisting of "Super Delegates." That is, super delegates are some chosen people of the party that can swing who the Democratic nominee may actually be, especially in closely called contested primaries. To that end, Sanders proudly announced today, in the nation's capital, that his campaign has generated popularity and “a fervor” to us politics & elections again, winning "10 million voters" and 22 contested states. And, he proclaimed, "they are still counting votes in California." Bernie believes the American people appreciate how his campaign has brought to debate the "issues of working class families" typically tabled and undiscussed by corporate candidates.He's right. His working-family and honest political messaging is attracting voters, no matter the so-called media blackouts. His Democratic campaign success is the reason why national polling shows Bernie Sanders beating Donald Trump by a far much wider margin than Hillary Clinton could imagine. Silmultaneously, it appears that a Trump v. Clinton throwdown would be an electronic-voting machines dream, like Bush v. Gore. But, perhaps the democratic paradox of super delegates will prevail for a sure-win victory in November... or, perhaps the corporate machine that has enveloped the entrenched Democratic players will be allowed to continue to rue humanity's fundamental rights and future? We shall see... you at DC's election polls on Tuesday. Don't forget to use a paper ballot! + This post in no way endorses or condones any actions or lack thereof associated with government.